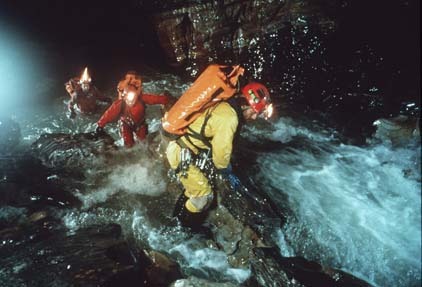 Kenny Broad (right), Noel Sloan, and Steve Porter traverse the "Metro" river gallery at -760m in the Sótano de San Agustín during high water. Noel Sloan in the Grand Cascade series between the -620 m depot (Camp 2B) and the Metro river gallery. Exceptionally high water following a freak rain storm on the surface forced the team to retreat to Camp 3 for three days after this photo was taken. Long shot of Camp 3 in the Sótano de San Agustín. 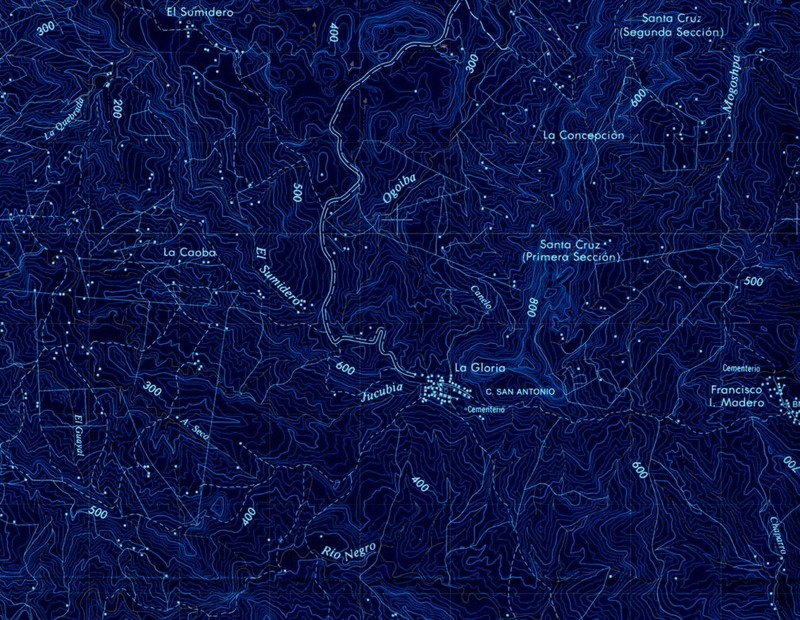 Camp 3 is located in the Sala Grande de la Sierra Mazateca (one of the largest known chambers beneath the Huautla Plateau) approximately a kilometer beyond the Metro River junction with the Grand Cascade. 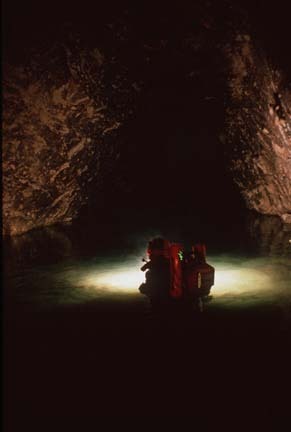 Inhabitants are dwarfed by the 250 m long, 60 m wide x 60 m high chamber. Camp 3 was home for the team for a total of 41 days in the spring of 1994. [photo �1994 Wes Skiles]. Remote Outpost: Camp 5 was suspended 3 meters above the San Agustín sump. 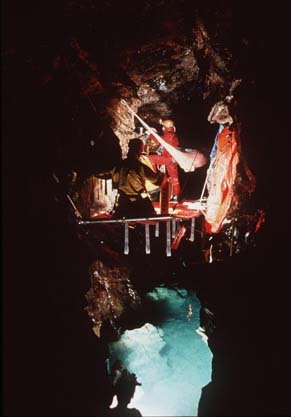 Occupied for 11 days during 4 separate diving assaults on the sump it was the least comfortable camp in the cave. Just behind the camera a 10 m cascade thunders into the chamber with a monotonous, deafening roar. Sleeping was in hammocks suspended across the canyon by rock bolts. 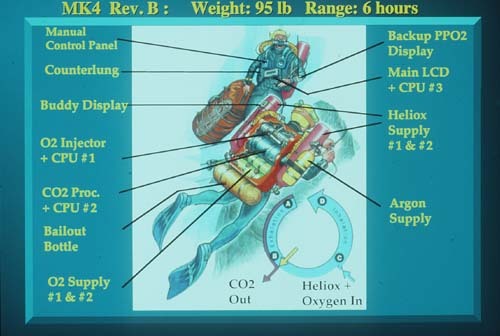 Artist's rendition of the MK4-B rebreathers as they were configured for the exploration of the San Agustín sump. 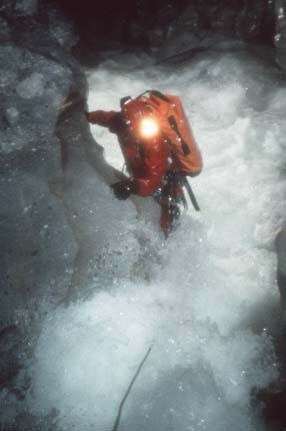 During the final push, am Ende and Stone used the single oversized duffel bag shown to carry all their supplies for the 6-day exploration push beyond the Sump on May 1, 1994. 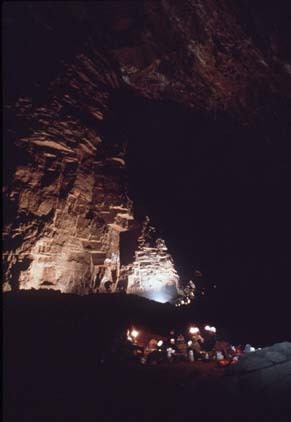 On May 1, 1994, Barbara am Ende leaves Camp 5 in the Sótano de San Agustín and heads off into the San Agustín sump. Sump 1 was 430 meters long reaching a maximum depth of 30 meters; Sump 2 was 180 meters long reaching a depth of 10 meters. 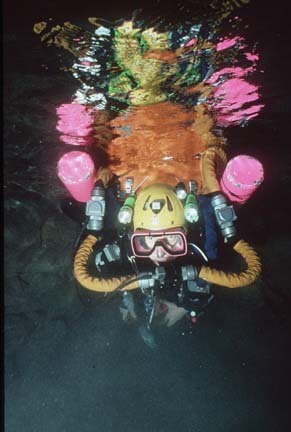 Barbara am Ende surfaces on the downstream side of Sump 2 in the Sótano de San Agustín, May 1, 1994. 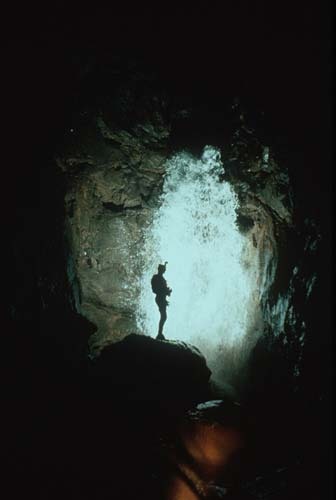 The Río Iglesia Falls at -1450 m. One of the most important discoveries of the 1994 expedition was the junction between the Río Iglesia and the subterranean Río San Agustín. 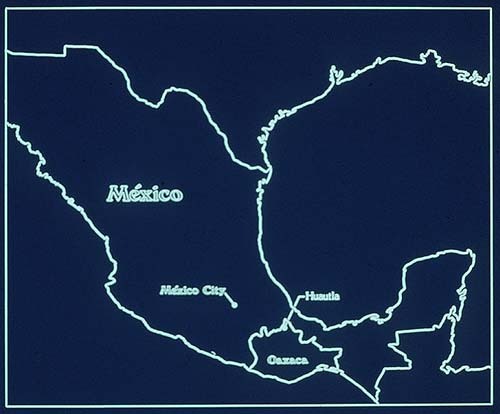 Their junction forms the "Main Drain" for Sistema Huautla, through which the majority of the water for the vast karst plateau flows. Río Iglesia, by comparison, carries nearly 4 times the water previously seen in Sistema Huautla. Barbara am Ende illuminates the spectacular 13 meter waterfall that marks the junction. Team photo on April 23, 1994: left to right, rear: Barbara am Ende, Paul Smith, Tom Morris, Wes Skiles, Kenny Broad, Steve Porter, Jim Brown. Front row, left to right: Noel Sloan, Bill Stone. Location map of Sistema Huautla in the state of Oaxaca, México.